This post is the first in a series of three posts about one street that still exists – Marine Drive – and several streets that no longer exist – most specifically Canal Street and Dante Place. These streets are a part of Buffalo’s old (and new) Canal District. 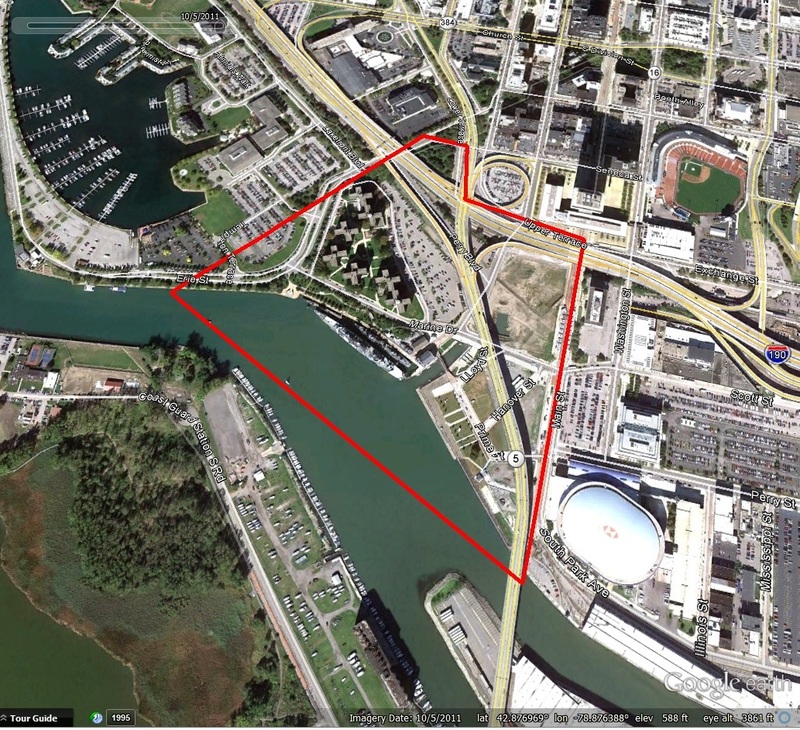 The Canal District contains some of Buffalo’s most fascinating stories. Today’s post will deal with the district when it was known as the Canal Street area. Part Two will come out on Friday April 4th and deals with the Italian Immigrant era, when it was known as Dante Place or “The Hooks”. Part Three will come out next week and deal with the last 60 years of the area’s history – the Marine Drive apartments and Canalside. Old Canal Street – Dante Place for the past quarter of a century – lies doggo this spring. Its days are numbered. Of some ordinary street it could be said it is dreaming of its past stories – but not Canal St – the old rip. If anything, Canal St. is like an ancient burned-out roue reflecting on a disreputable past. Canal Street and some of its immediate purlieus like Maiden Lane, and Peacock Street have empty houses with the windows bashed out. The old plaster in old rooms is broken and crumbling. Along the streets are old house numbers – 148, 156 – corroded and painted over and beaten by the weather of a hundred years. There is the occasional iron rail across what was once a barroom window, to protect it from stumbling drunks and lolling roustabouts. These are the flotsam and jetsam of an era long gone – a rough and roistering era of hard men and fancy women, of the waterside of Buffalo when it was young and heady with liquor, laughter and love at voyage end. It was the days when the canaler could sing that “The Erie was a-risin‘, the gin was gettin‘ low, and I scarcely think we’ll have a drink till we get to Buffalo”. It was the days when the sailors, swinging off their brigs and barks and ready for a fight or frolic, could yell: “Canaler, canaler – you’ll never grow rich; you’ll die in the ditch”. Canal Street was only two blocks long, running between Commercial Street and Erie Street. The street was called “the wickedest street in the world”. It was said that, during its heyday, there was a murder every day. 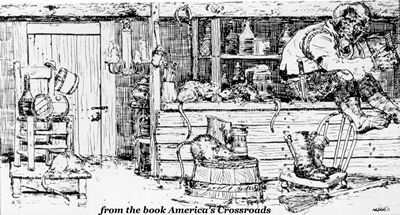 Legends were told of saloon owners who would serve a poisoned drink, steal a man’s clothes and personal items, and dump the body in the canal. The supposed first “dive bar”, Dug’s Dive was located along the canal, down a steep set of slippery steps from the towpath, so patrons sometimes “dived” into the bar. The proprietor of Dug’s Dive was William Douglas, a former slave. Canal Street was a busy place, due to its location on the waterfront. The Canal folk met the sailors from the Lake. In 1829, when the road was laid out, it was known as Cross Street because it crossed several of the short streets between Commercial Street and Erie Street. Other streets in the area were Peacock, Fly, Water, Hanover, LeConteuix, Evans, Lake, Lloyd and State. During the summer, the very worst class of people inhabiting this portion of the first ward, have been permitted to gather there in unusual numbers, publicly enacting the most disgusting scenes, rioting by day and reveling by night…If the canal could speak, and its waters cast up the hidden bodies of those who have doubtless come to an untimely end, its tale of horror would startle the public mind, and those whose duty it is to look after the public peace of our city, might feel and realize how great this has been of their omission of duty. By 1854, the canal had become supreme in the district, and the name was changed to Canal Street. The street was a busy place – The Erie Canal connected under Main Street with the Main-Hamburg Canal, running east to connect with the Clark-Skinner Canal, which started around Chicago Street and ran south to the Buffalo River. On the lake were the Prime, Coit, and Niagara slips, among others. 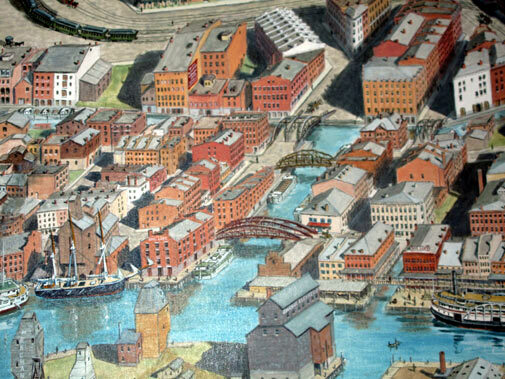 The Canal Street district of the city was bounded by The Terrace, Lower Main Street, Erie Street and the harbor. The Canal Street district was connected to the rest of Buffalo by foot and wagon bridges over the Canals. Maiden Lane got its name from the early days of Buffalo when the young women said goodbye to their sailor sweethearts or welcomed them home from voyages. The Canal District quickly established itself with bars and taverns to entertain the canal workers. Along with the taverns came gamblers, drunks and working girls. Long nights of drinking and brawling turned the area into a crime-ridden district. The Canal District was often referred to as the “infected district”, both due to the low moral standards in the area and due to the diseases that ran rampant syphilis, chlamydia as well as diphtheria, scarlet fever, whooping-cough and the flu. The Express described the area as containing “broken down hovels of ill-fame, presided over by ill-favored hags, who have long forfeited their right to the name of women”. The saloons were profitable enterprises for many Buffalonians. When early reformers and settlement houses tried to come in, they failed to lure the men away from the saloons. The saloons of the time functioned as a labor bureau, a post office, a source of credit, a political headquarters, an ethnic gathering place, and a spot where a man could get a free lunch along with his beer. The song “Buffalo Gals” was written by John Hodges in 1844 and refers to the women who lived in the canal district. By the 1880’s, it was said that there were as many as 400 women “of easy virtue” in the Canal Street section of the City of Buffalo. Included in the district were 93 saloons, 15 concert-hall dives, and hundreds of dance-hall girls. While Grover Cleveland was Sheriff in 1870, Cleveland had tried to clean up the place, but was unsuccessful. Many of the women were employed by the saloons as “cooks” but were on hand to provide companionship to the men of the barges. These women of the district were not allowed to go further uptown than the Liberty Pole, which was located near where the Memorial Auditorium was later located. Once a week, the women were allowed to go into town to go shopping. During the Pan-American Exposition of 1901, a number of women from New York City came to the canal district, attempting to make money off visitors to the Pan-Am. They planned to take the “Buffalo Gals” out of their territory by bringing their worldliness to the area. Before the Pan-Am, there were 500 Buffalo women living in the Canal district. The ladies of Canal Street resented the NYC women, and joined forces and attacked the NYC women with clubs, knives and fists, chasing the NYC women out of Buffalo. The NYC women were escorted by police back to NYC on packet boats and trains. In 1895, the Erie Canal was deepened and shortened. Newly built railroads were built, which were more efficient in moving goods across distances with greater speed and power. The changing transportation landscape began to change the neighborhood. Immigrant families began to settle in the area. The rule limiting the women of Canal Street from venturing north into Buffalo proper was lifted. These ladies “of the fancy ways” began deserting the area. The vice they represented moved to other areas in the city, including the red light district of Vine Alley (located between Elm and Oak -the area was razed in the 1920s when William Street was extended from Michigan to Broadway). After the women left, the saloons and concert halls began to close. Stay tuned for Part Two, which will discuss the Canal District’s transition into Dante Place, coming out on Friday April 4th. Hart, Mary Bronson. Partitioning Poverty: Zones of Influence in Social Work. Boston Evening Transcript. August 29, 1900. Nicolosi, Rachel. Love for Sale: Prostitution and the Building of Buffalo, New York, 1820-1910. The Exposition: vol 2, Issue 1. 2014.
very interesting post. It amazes me the evolution of how areas go through change. You do a great job of telling us the story of Buffalo! Thanks for sharing all this info! I love stuff like this! Great job. I love to hear the story of early Buffalo. My 3x great- grandfather when he first came here had a tailor shop at the corner of Commercial and Water. This was 1848- 1850 time period. Thanks and keep the stories coming. I remember going to parties at the Dante Projects when Ifs in high school. The people were very friendly and use I to go the Crystal Beach boat before that. I remember going to a Stan Kenton dance on the boat. Twas very nice because everything was still happening down that way, even the light house stayed on at night. My grandfather Francesco Lucca…took over the infamous ONLY THEATER SALOON…and helped bring peace and order in the community. He would line up the winos and toughs in the early morning. .give them a shot of whiskey and a sandwich…and they never bothered his business during open hours. I sent the above….Fran Lucca..
retired Print, Wire Service, Broadcast reporter..
on May 20, 2014 at 8:05 am | Reply Discover Buffalo, One Street At A Time | Good things happen in Buffalo, NY. Thank you for this great article on Buffalo history. My grandparents came to America in May 9, 1910 from Calatafimi Di Trapani, Sicily. My grandfather Francesco and twin brother Vito lived in the area of the time called Dante Place. Francesco came here with his wife Maria. His twin brother Vito married Vita on May 31, 1910. The addresses were 68 and 45 Evans St., 30 State St., and 128 Erie St.
Francesco a few years later opened up as a Grocer and his store was located at 365 Sycamore and raised 5 children. My father Leonardo was the first born on November 30, 1911 and was baptized at Our Lady of Mount Carmel at 41 Fly St. Who would have know that my grandparents raised their family and the first number of years was in this Canal District among 75 brothels and more than 120 saloons. Francesco child number 4 Nicholas died at a few days short of 11 months from whooping-cough. Francesco twin brother had 2 children and moved back to Sicily around 1915. I think because of the poor conditions of this district. Thanks for sharing your story Franklin!! I find that whole area so fascinating!! I’ll see if I can find a way to do the overlay of the Christian Homestead map with what’s there now..;..I will let you know if I’m able to do so.